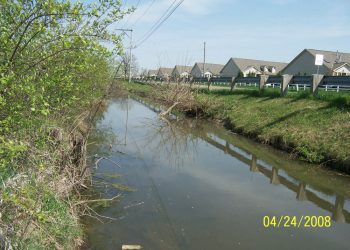 The Clover Groff Run Stream Restoration Project includes 4 phases totaling more than 4 miles of stream restoration for the City of Columbus Recreation and Parks Department at their Franks Park, Spindler Park and West Broad Street Park locations and for the City of Hilliard and the River Institute at Latham Park. Projects were funded by grants from the OEPA Division of Surface Water and the USEPA, under provisions of Section 319(h) of the Clean Water Act and the OEPA Division Environmental Financial Assistance WRRSP. 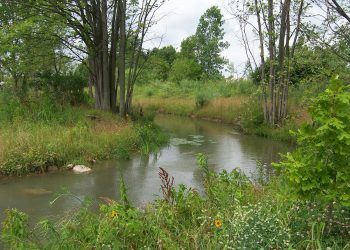 All four phases included restoring a hydromodified ditch into a natural channel with associated floodplain capable of meeting Ohio’s WWH designation. Clover Groff Run, a tributary to Hellbranch Run in the Big Darby Creek watershed (HUC-11 05060001-220) was ditched in the early 1900’s for agricultural drainage leaving a very low gradient Rosgen type “F-6” stream, indicating severe channel incision, poor substrate quality, stagnant glide-like low flow characteristics, poor floodplain and buffer diversity and density (Pic 1). Left in this condition, there was little biological diversity within the ditch system and little chance of natural recovery. Preconstruction habitat and biological evaluations yielded a QHEI score of 35, IBI score of 24 and a HMFEI macroinvertebrate score of 11. 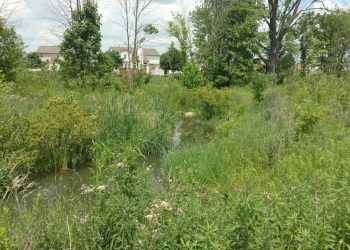 The goals of the Projects were: 1) to return the Clover Groff ditch to a functional stream with an accessible floodplain and 2) to provide an ecosystem that would meet a use designation of WWH water quality criteria. 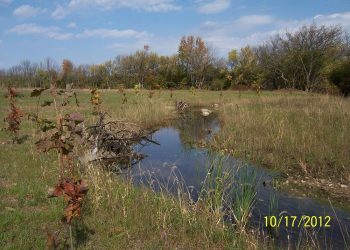 The projects restored 21,694 linear feet of stream within the four parks and created 52 acres of vegetated floodplain. 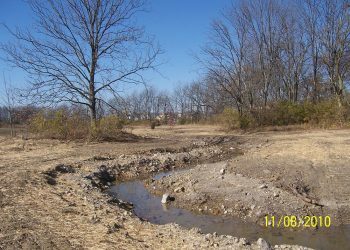 A new sinuous stream channel within an active forested riparian floodplain was built and the stream relocated from its current alignment to a more central area within the parks. Construction created a unique ecological asset to the recreational areas. QHEI scores are exceeding 60 and already meet imposed permitting conditions in three of project areas. 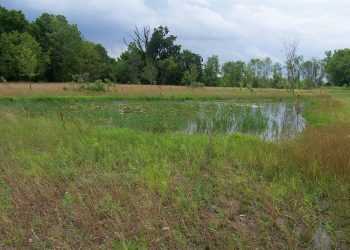 Nearly seventy-five percent of the constructed floodplain meets a Category 2 wetland requirement. Clover Groff construction started at Franks Park in August 2009 and is being completed at West Broad Park in 2017.